Clean fun waves on the smaller side to kick off the weekend on the Surf Coast ahead of an onshore change and building swell into the afternoon. Yesterday was good all day on the protected reefs with easing 3ft to occasionally 4ft sets and NW tending W winds. The swell has held well into this morning and to an easy 3ft on the Surf Coast and 5-6ft on the Mornington Peninsula, cleanest in protected locations. After a couple of days of fun surf on the Surf Coast, we've got a few more days to come, and with more size. The current cooler weather and frontal activity is due to a strong node of the Long Wave Trough stalling across us. The node will start to weaken mid-week and slide off slowly to the east, but before this we'll see the strongest of the frontal systems through this period being projected up and towards us. The polar front developed south-southwest of WA yesterday and is currently generating a good elongated fetch of W/SW gales through our western swell window. It will ride up high towards the Bight today and this evening, remaining just in our swell window before pushing across us tomorrow morning. On the tail of the front a slightly weaker fetch of strong SW winds will be slung up towards and into us, and this will slow the easing trend in size through the second half of the week. Coming back to tomorrow though, and in the morning an initial new SW groundswell from a polar front on the weekend should offer 3ft+ sets on the Surf Coast, 5-6ft on the Mornington Peninsula ahead of a building short-range W/SW energy from the front moving through. A fresh and gusty morning N/NW breeze will give into a strong late morning W/SW change and building surf reaching at least 4ft+ on the Surf Coast into the late afternoon/evening and 6ft to possibly 8ft. 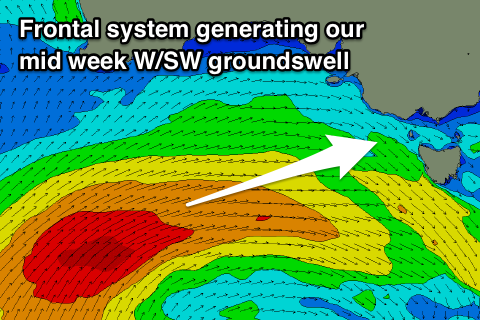 A peak in W/SW groundswell energy should be seen on Wednesday to 4-5ft+ at swell magnets on the Surf Coast (smaller at more protected breaks) and 6-8ft to the east, best in protected spots with a morning W/NW wind, shifting W/SW-SW late morning. The swell should start to ease off late in the day, dropping back a touch from 4ft and 6ft respectively Thursday morning. Another broad front developing south-west of us Wednesday should keep wave heights up into the afternoon before things wind down from Friday with easing 3ft waves on the Surf Coast and 4-6ft waves to the east. Winds will be great again for protected locations Thursday morning and out of the W/NW, holding until early afternoon and then shifting W/SW, slightly less favourable Friday and early W/NW before shifting SW and then S/SE as a high pressure system finally moves in. This will top off a great run of swell and conditions which shouldn't be taken for granted in the middle of summer. Over the weekend options will start to open up across the exposed beaches as the surf continues to slowly lose size. Saturday doesn't look great with a morning E/SE breeze, much better Sunday with a N/NE offshore. More on this Wednesday though. In descending latitude, around 6am the barometer was down to 988.4hPa at Cape Otway, winds gusting 41kts. King Island down to 986.5hPa, winds gusting 46kts. Cape Grim down to 984.6hPa, Cape Sorell down to 980.4hPa, Low Rocky Point down to 978.3hPa. Maatsuyker Island down to 977.1hPa. That's roughly 11hpa difference over ~600km. Very impressive. I must be getting soft. Donned a good 3/2 for this morning's session after wearing a ragged, leaking short arm thing all Summer. Glad I did when a couple of those rain squalls came through with the cold Westerly. Pumping and in the middle of summer! Hope you're all getting a fix. Super fun the last few days Craig but that strong wind yesterday arvo has broken the swell, there's some size about but mostly fat shoulders after an exciting drop. I managed to get a few fun ones this morning and I'm really glad that the water is warm because that early w/nw was brisk!